Think you're having a problem with the front hub bearing assembly on your LR3, LR4 or Range Rover Sport? We carry all the parts that you would need to repair this issue and have an in-depth video on how to diagnose and repair your hub bearing. 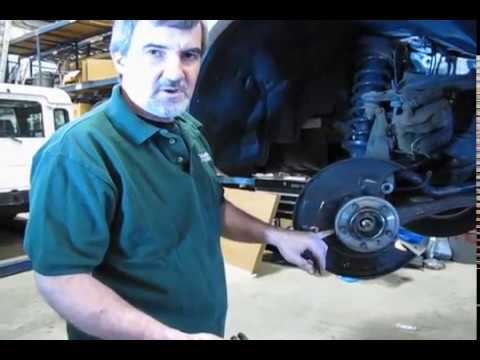 Atlantic British Ltd. Repair & Maintenance Academy How-To Video: Watch Doug, our Land Rover Master Technician, explain front wheel bearing failure on a LR3, 2005-2009. He goes on to discuss how to resolve this common issue with replacement of the front hub bearing assembly. This replacement of the hub bearing assembly is also valid on a Range Rover Sport, 2006-2009. Questions about this video? Call us at 1-800-533-2210 or contact us via live chat. The product was easy to install thanks to the detailed video on the website. While I consider myself mechanically inclined, I have never installed a hub before. I did decide to do the rotors and pads since I had to remove them both. Car first made a humming noise at 45 mph then a terrible noise all the time. Once I got the wheel and rotor off I noticed play in the hub assembly. It would not turn freely. Not sure how the truck was driving! Took 4 hrs of shop hammering, torch heat and home made hub puller to get it off. Learned a lot. Part went on easy. Did the front brakes and rotors at the same time. Very good service from AB.